I often think back to life in England in the early 1980s and the rich cultural diversity which grew primarily from the political and socio-economic conditions of the Thatcher-era. For many the early eighties were difficult times and much has been said about the young people who were facing the realities of life post-school. Well, I was one of those school leavers, and, like my peers, recall being far more interested in music, fashion and girls. It was a fascinating period, young people in the main were eager to be involved in ‘something’. That ‘something’ could have been anything, the point was to tie your colours to a mast and if that mast was sub-cultural in any way then so much the better. My collection of pin badges was as considerable as it was varied. At fourteen I was yet to commit myself to any one movement so my jacket invariably covered many bases. Remember the CND pin badge? 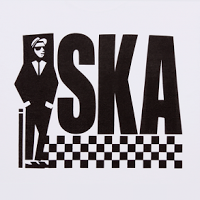 The endless MOD/SKA badges with the Two-Tone dancing man or the Madness symbol? The Who with the arrow or the Lambretta modelled by a SKA girl? The local town square was a sea of colour and fashion styles, Punks were showing off their bright Mohican’s in one part, Skinheads in jeans, Doc Martins and Crombies, Soul Boys inspired by Kevin Rowland’s ‘Dexy’s’ look, ‘Grebo’s’ in their leather jackets with long hair and cut off denims. There was always the odd Hippy in a sheepskin in the middle of summer, New Romantics were daring to wear their sister’s eye liner and even Rockabilly was back. But the early 80s belonged to the Mods, the 80s revivalists were on a different agenda to the originals twenty years earlier. The fishtail parka was essential, the zoot suits, less so. Your local towns were deafened by the sounds of ‘the hairdryer’ and the curses of young Mods at the side of the road covered in oil as their beloved Vespa’s coughed, spluttered and inevitably died. But enough of my ramblings, if a photograph could capture a thousand memories then take a look at these at remember a time when having an identity mattered, walk down any high street today and it is awash with people dressed EXACTLY the same. We’ve shunned drain pipes, loafers, Harrington’s, donkey jackets, embroidered denims, two-tone suits and safety pins in homemade t-shirts for a brown paper Primark bag.